I’m not sure why but I used to think of risotto as a big complicated project. Somehow I got it in my head that you absolutely must make your own stock and add it a thimbleful at a time and stir and stir and stir and if you stop stirring for even a second, the whole thing turns to garbage. 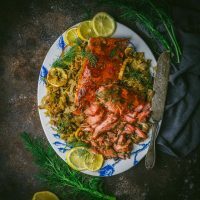 While it is true that the better the stock is, the better your risotto will be, there are a lot of ways to impart flavor into the dish using simple, everyday ingredients. And while I’ve never had great results from simply pouring in all the stock at once, the process is a lot less delicate and precise than you might think. The rice itself should take less than 20 minutes to go from raw to beautifully creamy and al dente. Even including the time it takes to cook the mushrooms, that’s well within the realm of an easy weeknight dinner. The crispy sage adds a great flavor and texture. For a VEGETARIAN version, use good vegetable stock. 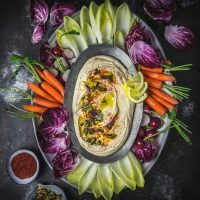 Look for note below on tips for making a VEGAN version. Not shockingly, the first thing to consider when making risotto is the rice. Using short-grain rice is key because when stirred, it releases starch that gives risotto it’s signature creamy, silky texture. If you use the wrong kind of rice, no amount of stirring will work because the starch just isn’t there to begin with. Rice for Risotto. In this case, Carnaroli. 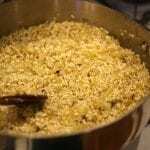 While Arborio is the rice most people reach for, it’s actually a medium-grain rice that is quite easy to overcook and can turn mushy. It can make fantastic risotto, but it requires a lot of careful attention (of which I’m often in short supply). I actually much prefer Carnaroli because it not only produces the creamiest risotto, each grain maintains its shape so it’s also much more forgiving to cook with. 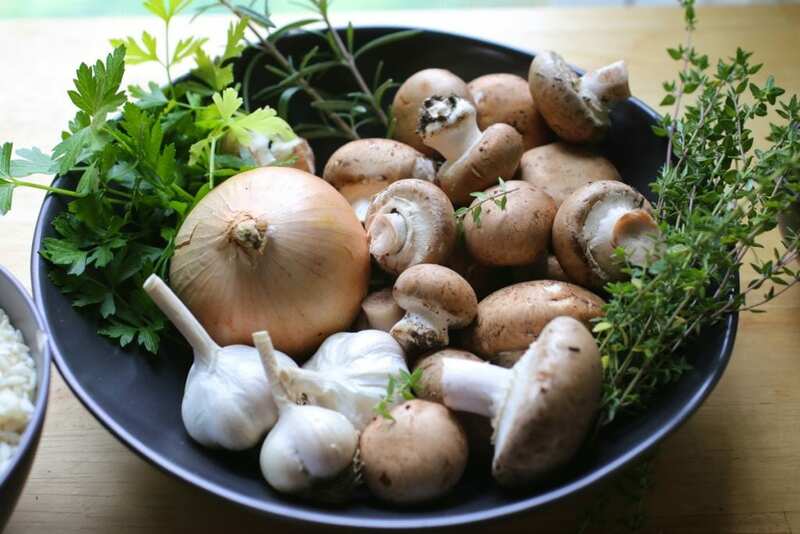 Flavorings for risotto: mushrooms, garlic, onion, and lots of herbs. The second thing to think about is flavor. Especially if you’re using store-bought stock, you want to kick up the flavor in other ways. Onions are traditional, but garlic and lots of fresh herbs also add a lot. Use your favorites, but we like a mix of thyme, rosemary and parsley. 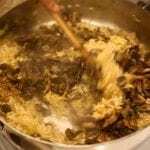 Since this is a mushroom risotto, we used a full pound of fresh mushrooms (ours were crimini, but a mix of cremini with other kinds like oyster, shiitake, hen of the woods and chanterelle would be fantastic. Even white button mushrooms are fine, though they don’t have nearly as much flavor). 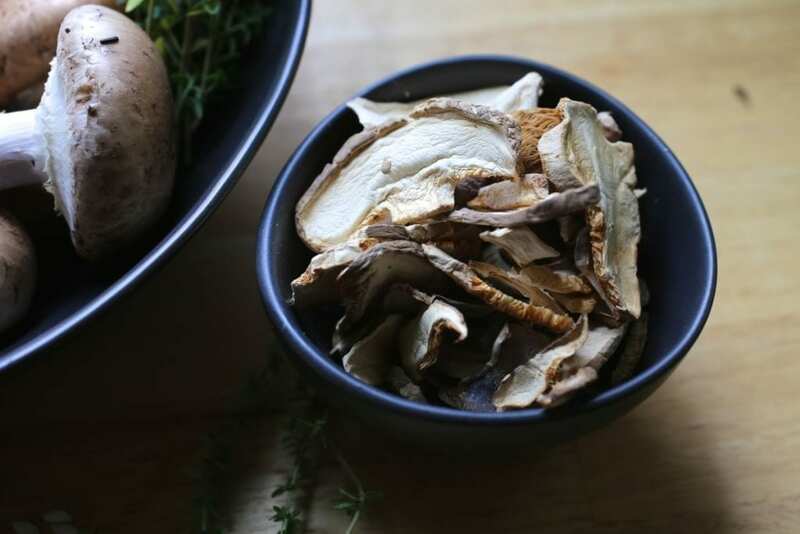 An ounce of dried porcini also adds a deep flavor, not just from the mushroom themselves, but also the broth that they soak in. The last thing is technique. Make sure your stock is hot before you start softening the onions. You want to ‘toast’ the rice in the pan with the oil and onions (in Italian, this step is called the ‘tostatura’). Don’t let the rice actually brown because this would lock in the starch, but you do want the grains to be heated through before you add the wine. Then add the stock a ladle or two at a time and stir as much as you can without feeling obsessive about it. Spread them out in the pan and then don’t touch them. Just leave them alone. Seriously, just ignore them until they shrink and caramelize. They’ll turn glorious and dark. Then add the garlic and herbs. Once the rice is cooked but still al dente, stir in the reserved mushrooms and the cheese. 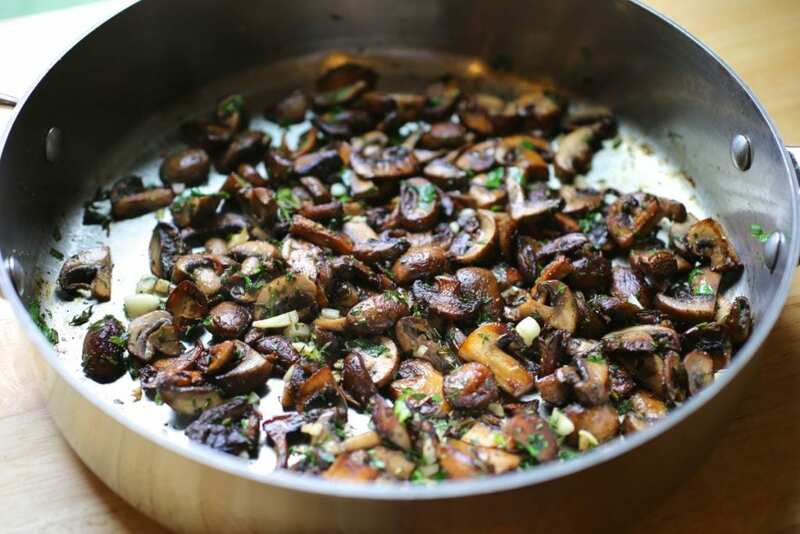 The buttery, herby, garlicky mushrooms would be great just on toast or eaten straight out of the pan. 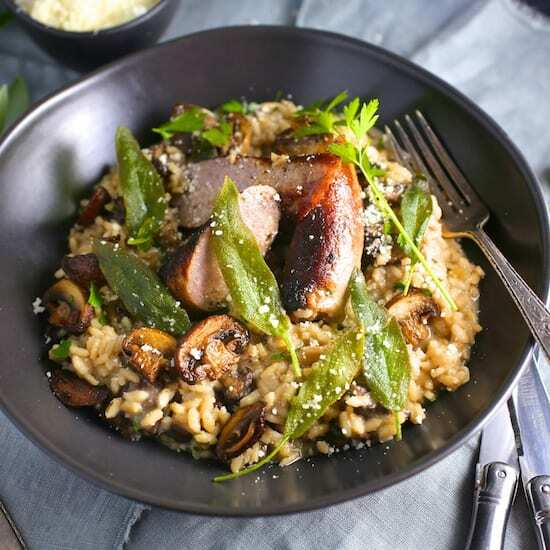 Just to gild the lily, we topped the mushroom risotto with crispy sage and a simple but delicious pan-roasted sausage (but the risotto makes a fine meal all on its own). By the way, now that I know how easy it is, I now want crispy sage on absolutely everything, including cereal and apple pie. Risotto is one of the most versatile dishes around. You can make it with just about any kind of stock or broth you want, stir in your favorite vegetables, and top it with anything from crispy pancetta to shrimp and lobster. Make LOTS so you can make Crispy Risotto Cakes (or Arancini) with the leftovers! It’s traditional to stir in butter at the end of cooking to make the dish even creamier but we found we didn’t need it. If you want, stir in up to 3 tablespoons of diced unsalted butter just before you stir in the cheese. Don’t feel you need to use all the broth that you’ve heated. Taste the rice itself to tell when it’s ready. If you need more, add a little more hot stock or even hot water. 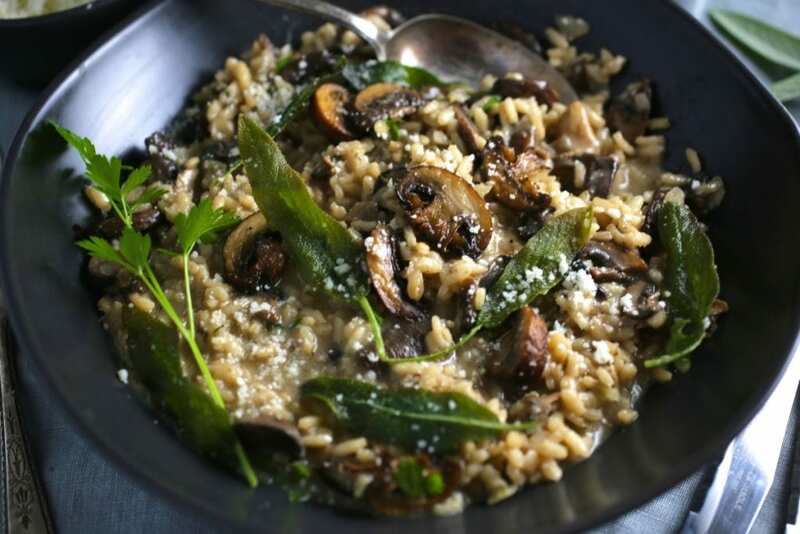 Matt likes his mushroom risotto on the thicker side but keep adding a bit more stock for a lighter, looser dish. The dish could easily be made vegan by eliminating the butter and cheese. To replace the salty pop that Parmesan gives, try finishing the dish with frizzled capers (capers cooked in a little hot oil until they crisp up). 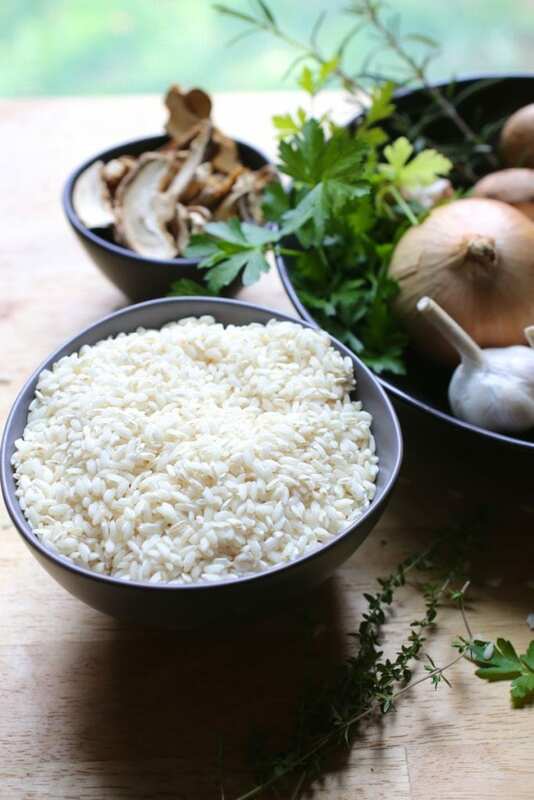 Vialone Nano, Baldo, Calriso, and Maratelli are other types of risotto rice. The terms “Superfino,” “Semifino,” and “Fino” you might see on packages refer to the width of the grains, not quality. 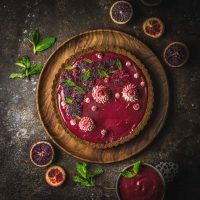 Make the crispy sage: Heat the oil in a small skillet or saucepan (if making sausages as well, make sure they’ll fit in the pan) on medium-high until shimmering. Add the sage and tilt the pan, as needed, to make sure the sage is sizzling in the hot oil. Cook until the leaves darken and turn crisp, about 30 - 60 seconds. Remove to a paper towel lined plate. If you’re making the sausages, add them to the pan and cook until brown and fully cooked. Set aside and cover with foil to keep warm. Make the risotto: In a medium saucepan, heat the chicken broth and keep warm over low heat. 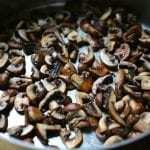 Place the dried mushrooms in a small heatproof bowl or mixing jug and pour over 1 cup of the hot stock. 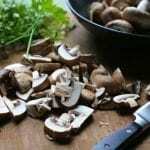 Set aside for 10 minutes then take out the mushrooms and give them a rough chop if the pieces are large. Reserve the mushroom soaking broth. Preheat a high-sided pan or Dutch oven over medium heat. Add 1 tablespoon of oil and all the butter. When the butter is foaming, add the fresh mushrooms and spread out into a single layer as best as possible. 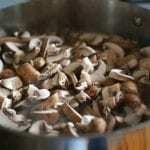 Let the mushrooms cook without stirring until they turn deep golden brown on one side (4-5 minutes). Give them a stir, add the herbs and season with salt and pepper. Cook until other side browns (3-4 minutes). Add 2 cloves of the garlic and the reconstituted dried mushrooms. Sauté for another minute then remove mushroom mix to a bowl and set aside. Return the pan to the heat and add the remaining 2 tablespoons of oil. 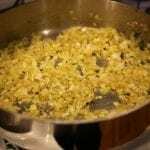 Saute the onion and the remaining garlic clove until onion turns translucent (4-5 minutes). 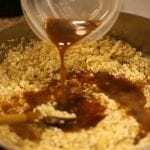 Add the rice and stir until it is well-coated, cook it for 2 minutes. Pour in wine and stir until it’s nearly all evaporated. Stir in a ladle full of hot broth along with the reserved mushroom soaking liquid (note: leave out the last bit of mushroom broth, and don't swirl it as you pour, as there may be grit on the bottom which you do not want to add). Stir until the rice has absorbed the liquid. Add the broth one ladle at a time, allowing the rice to absorb each addition of broth before adding more. 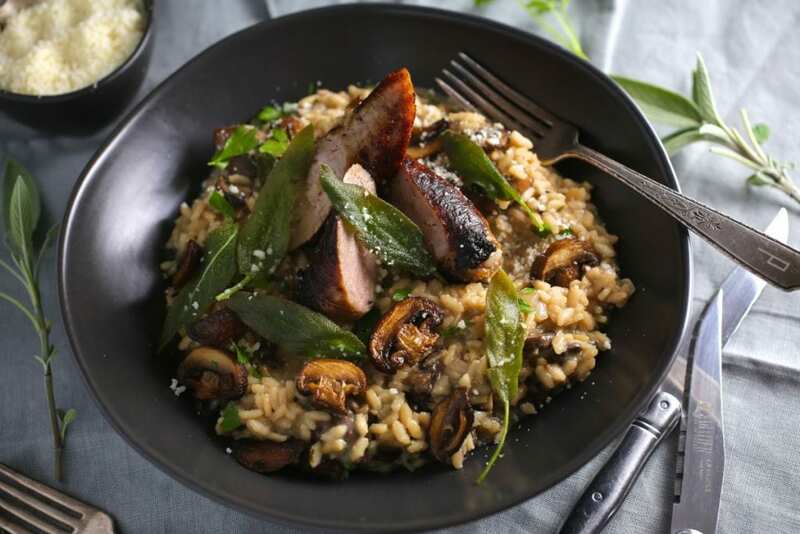 The risotto should be tender but still with a little bit of bite (al dente) as well as creamy (you may not need to add all the stock). It will thicken as it sits so make it a little looser than you want it to ultimately be (if you want it creamier, this is when you stir in the extra butter). 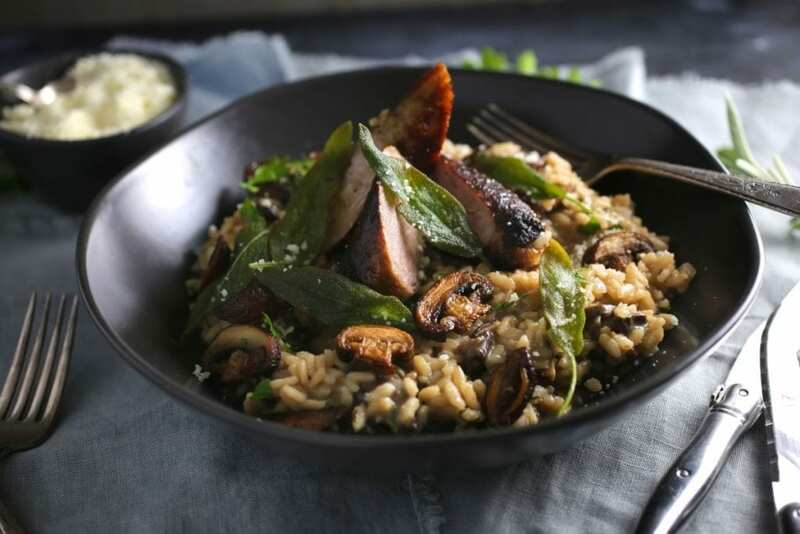 Stir in the mushrooms and Parmesan cheese and top with the crispy sage and sausage (if using). 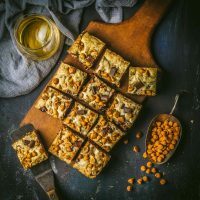 The dish could easily be made vegan by eliminating the butter and cheese. 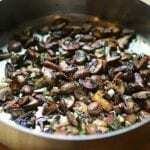 Cook the mushrooms just in oil, and to replace the salty pop that Parmesan gives, try finishing the dish with frizzled capers (capers cooked in a little hot oil until the crisp up). Made this last night and loved it. It was my first time making risotto and this recipe helped me nail it. I was very concerned about over seasoning, so my version definitely could have used a little more salt. Really excited to try to the risotto cakes tonight with some left over brie in my fridge. Yay, so glad you liked it! Once you get the risotto method down, it’s easy to make all kinds. Let us know how the cakes turn out. I’m obsessed with them.